If you followed a routine grooming schedule your pet’s grooming should be easy and stress free. If, on the other hand, your pet’s coat has been allowed to grow unattended there may be problems that you should be aware. Matting starts at the skin and works its way toward the outer coat. The only way to prevent matting is to thoroughly comb each section of coat from the skin out regularly. If you have been occasional brushing your pet, the top coat may appear healthy and fluffy but the coat next to the skin may be matted. 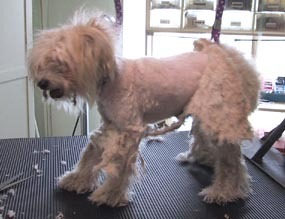 If the pet has been bathed without these matted areas removed, the mats felt and become impossible to comb through. The only humane way to deal with this problem is to clip under the mats, and if the matting is against the skin, it may require a complete shave down. To help prevent matting, see our article on How To Brush Your dog. Many people take their pet to the groomer for a spring grooming expecting to return to find Fluffy in fully sculpted style worthy of the show ring. They are horrified to discover that Fluffy has been shaved and looks more like a Mexican Hairless than a beautiful Bichon. This creates a stressful situation for everyone. The owner may be angry and the groomer is frustrated. The pet becomes stressed because of the high emotions of the people around him and may feel embarrassed if the owner seems to ridicule or reject him. If you prefer your pet to be styled in a fuller, fluffy cut plan on staying a few minutes upon arrival and allow your groomer to examine the coat. She can point out problem areas before the grooming and tell you what you can expect from the grooming. Understanding that the groomer does not have a magic wand that can just make months of damage disappear will give you a realistic picture of what would be most comfortable for your pet. Discuss with your groomer what you would like and set a goal to achieve that, including regularly scheduled grooming and learning proper home maintenance. Always cheerfully greet your pet when returning and if your pet did need a shave, counsel family member to never laugh or make fun of your pet.